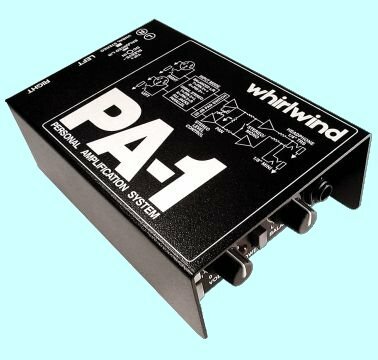 The Whirlwind PA-1 is a high output, low distortion, portable monitoring device suitable for critical listening in any professional audio environment. Sign language interpretation or language translation. Adding headphone monitoring to any piece of audio equipment. Boosting weak headphone outputs in high SPL environments. 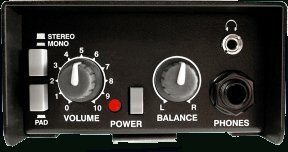 The PA-1 accepts either balanced or unbalanced stereo, line level signals through parallel XLR and 1/4" TRS inputs. for accepting signals from sources such as headphone jack outputs. Powered by two 9 volt batteries that load into easy access drawers or with included external PS24 AC power supply. Available from your Whirlwind dealer. Email us for the name of a dealer near you.